I’ve been in a slump for what seems like months, if not years, now. Molly’s death has left me feeling more bereft than anyone might imagine. But I really need to pull myself together and get to work on finishing the illustrations for A Bed for Little Cub as well as Ruby & Roofus and Pearl. Then I can breathe a huge sigh of relief and feel like I’m getting my life back on track. There is a project in the works that is about to be signed into official FULL SPEED AHEAD! As soon as I know we are heading to Boston to sign the contract I’ll make the announcement. Dreams really do come true, even after your worst nightmare. Molly’s death has left me feeling more empty and unfocused than any other event that has occurred in my life. There is no explanation for it. It’s simply deep grieving. When I find myself in a slump (I try to avoid the cliché ‘depression’) I have several sanity saving things that I do. First and foremost I read about other writers and artists and the struggles they endured and how they managed to survive. In addition to reading I also listen to these biographical books in audio format. The two books that I recently listened to are: Charles Addams: A Cartoonist’s Life by Linda Davis and Looking for Calvin and Hobbes by Nevin Martell. I’m not quite certain why I find reading about or listening to other creative people’s lives fascinate me so much, but they do. And more often than not I get inspired to get back to the studio and do my own work; create my own magic on paper. It’s not always easy but the important thing is to not let myself slip into the ‘depths of despair’. After all, tomorrow is another day, as an insightful character once said. It’s been some time since I last posted anything here in my writing blog. Molly’s tragic death plunged me into the depths of despair for quite some time. I don’t know if I will ever fully get over what happened. Time is the only thing that will help ease the pain and sorrow and anger of losing a beloved companion. 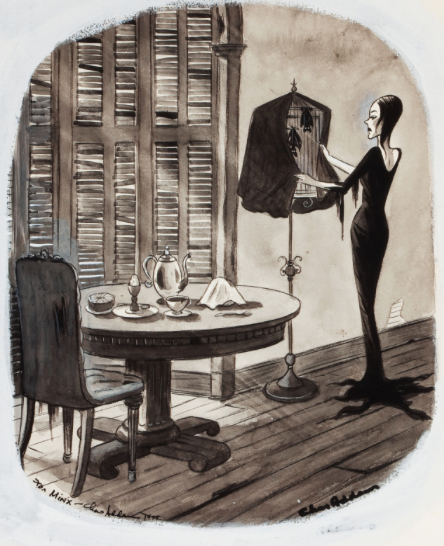 I have been rereading Linda H. Davis’s Charles Addams: A Cartoonist’s Life. I also downloaded the book on Audible in order to listen to it during the long eleven hour drive out here to Dearborn (where I am at the moment). 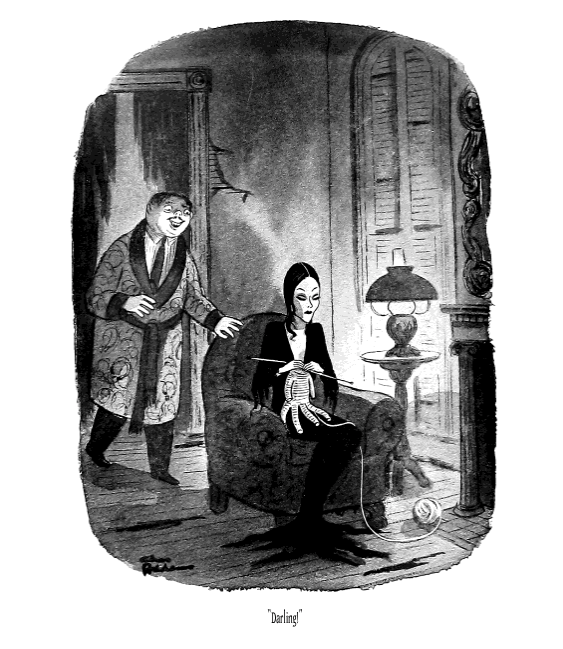 I mentioned in an earlier post that The Addams Family was always one of my most favorite series of cartoons in the New Yorker and book collections. And I will admit that when I was a young boy I enjoyed the tv show. Now, after all these years, I am getting a glimpse of the man behind the drawings and characters. To me, his life and work habits are fascinating. 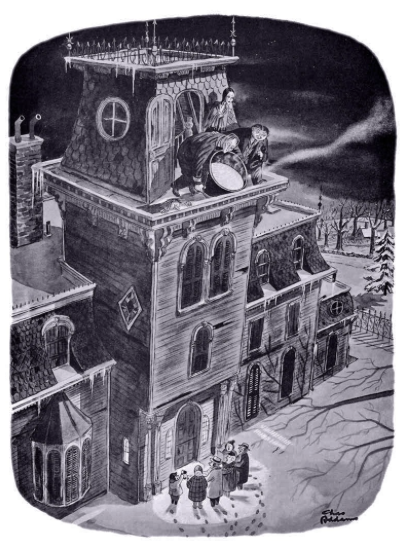 I’ve been wracking my brain trying to remember when it was that I first discovered the drawings done by Charles Addams. It had to have been when I was between twelve and thirteen years ago and living in a large, rambling farmhouse that my family rented on the Eastern Shore. The farmhouse was surrounded by cornfields and soybean fields. From my upstairs bedroom windows these fields resembled the vast ocean when the wind blew the leaves in undulating patterns. I never found the Addams Family cartoons scary or frightening. To me their huge rundown Victorian mansion was cozy and inviting (for some strange reason). 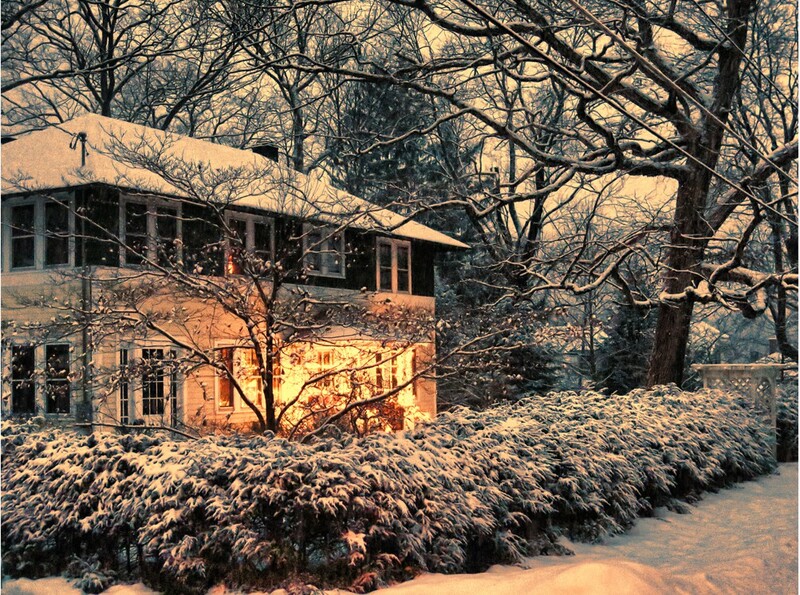 The high ceilinged rooms with their pools of pale lamplight and family members huddled together reading or watching tv epitomized coziness and togetherness in my mind. This cartoon is a good example as to what I mean. I always longed to live in a house that had a bay window with cushioned window seat just so that I could curl up with a good book on a stormy day or night and be one of the Addams Family’s members. It was cartoons like this one, as well as my obsession with early Gothic romance novels, that prompted me to cover an old flat topped trunk with a quilt and pillows and push it under one of my bedroom windows so that I could read and write in my own cozy, Gothic setting. To this day I still keep the rooms in our house darkened with pools of lamplight where I can read or write. Drawing is the only activity that requires me to have better lighting in the studio. But even then the studio is dark with the only light coming from my drafting lamps. 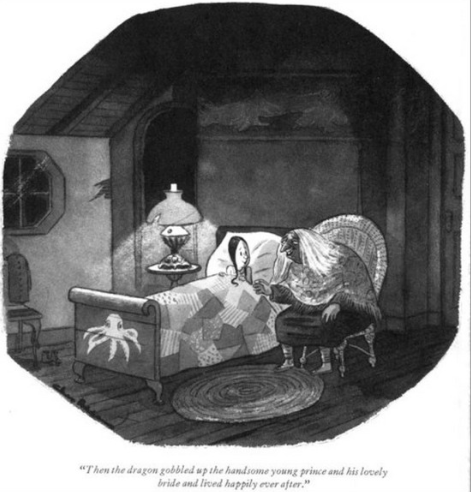 This cartoon, of course, exemplifies my idea of reassuring coziness at night in a bedroom. There is another cartoon of Wednesday in her bedroom that I have to find (and post) in one of my books back at Henwoodie. It was Wednesday’s octopus that inspired me to give Gideon an octopus for his beloved stuffed toy. In fact, the cartoon I want to find shows Wednesday’s octopus as having pointy, spidery tentacles. The first octopus I drew for Gideon also had these. 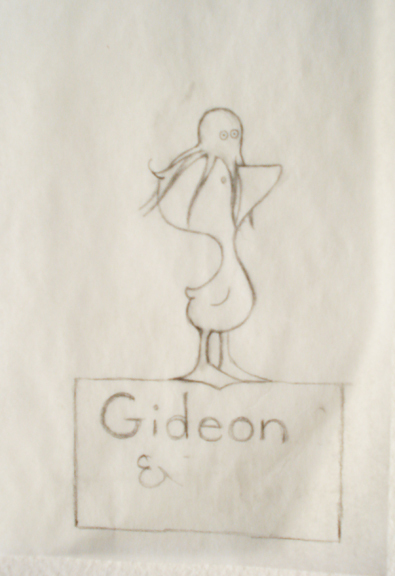 One of the very first sketches of Gideon. You will notice that I hadn’t named his octopus at this stage. I have always loved, loved, LOVED this cartoon! Mostly because of the wonderful perspective shown in the mansion. When I was a young boy, who had fallen under the Addams spell of ghoulishness, we used to drive to Nanticoke River to fish and crab. I hated these activities and always took a book to read while my family fished and crabbed. There were two exciting things about these trips: 1) we always stopped at a small mom and pop grocery store where I bought an Archie comic book for five cents and some of the best cookies I’ve ever eaten. I’ve never had cookies like these anywhere except at this little grocery. I can’t even remember what kind they were. My suspicion is that they were some sort of molasses flat, dark cookies. 2) we always had to drive past a lonely, dilapidated Victorian house that looked exactly like the Addams Family mansion. This house stood alone in a field with dark, broken windows and the tall tower where I imagined my bedroom would be on the top floor. I wish I had had enough foresight to have photographed this house. But, for some reason, that thought never occurred to me. It was enough just to see whenever we drove past and wonder if anyone lived there. Naturally, I imagined that a real life Addams family must occupy the house. My novel, Wythe’s End, is my Addams Family without being ghoulish and creepy. 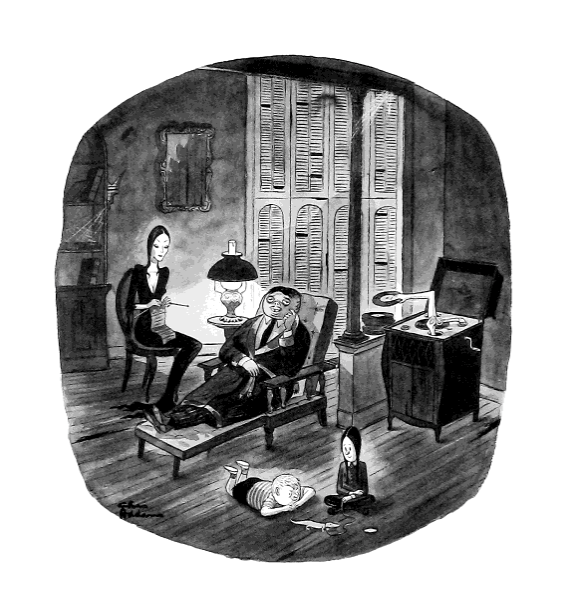 It was the strong family bonds within the Addams family that impressed me as much as the spooky, darkened rooms. 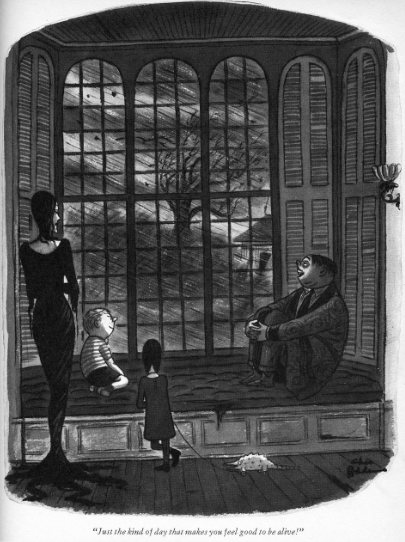 So, for now, I am still listening to the chronicles of Charles Addams’s life and adventures. When I listen to the audio book I am always in bed, in a darkened room, with one small lamp providing a pale pool of light for comfort and nostalgia.